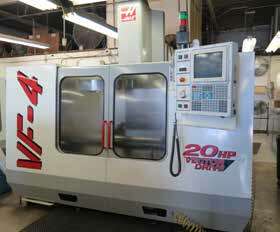 1999 Haas VF-4 4-Axis CNC Vertical Machining Center s/n 18601 w/ Haas Controls, 20-Station ATC, CAT-40 Taper Spindle, Brushless Servos, 4th Nozzle, Delta/WYE, Rigid Tapping, Gearbox, Chip Auger, Hand Wheel, Coolant. 1997 Haas VF-1 4-Axis CNC Vertical Machining Center s/n 113444 w/ Haas Controls, 20-Station ATC, CAT-40 Taper Spindle, Brushless Servos, Programmable Coolant Nozzle, Quick Code, Rigid Tapping, Chip Auger, Coolant. 2007 Daewoo/Doosan Lynx 220A CNC Turning Center s/n L2201992 w/ Fanuc Series 0i-TC Controls, Tool Presetter, 12-Station Turret, Hydraulic Tailstock, Parts Catcher, 6 1⁄2” 3-Jaw Power Chuck, 16C Collet Nose, Chip Conveyor, Coolant. 2005 Daewoo Lynx 220A CNC Turning Center s/n L2200075 w/ Daewoo-Fanuc i Series Controls, Tool Presetter, 12-Station Turret, Hydraulic Tailstock, Parts Catcher, 6 1⁄2” 3-Jaw Power Chuck, 16C Collet Nose, Chip Conveyor, Coolant. 1998 Daewoo PUMA 200C CNC Turning Center s/n PM200532 w/ Mitsubishi Controls, Tool Presetter, 12-Station Turret, Hydraulic Tailstock, Parts Catcher, Floppy Disc, 8” 3-Jaw Power Chuck, 16C Collet Nose, Chip Conveyor, Coolant. Bridgeport Series 1 – 2Hp Vertical Mill s/n 215502 w/ 2Hp Motor, 60-4200 Dial Change RPM, Chrome Ways, Power Feed, 9” x 42” Table. Tuda Tudor-Max 19×51 19” x 51” Geared Head Gap Bed Lathe s/n 10026 w/ 25-1800 RPM, Inch/mm Threading, Tailstock, Power Feeds, Trava-Dial, 12” 3-Jaw Chuck, KDK Tool Post, Coolant. Hardinge TFB-H Wide Bed Tool Room Lathe s/n HLVH-2199 w/ 125-3000 RPM, Tailstock, Power Feeds, 5C Collet Closer, Coolant. Overbeck Machine Twister Speed Lathe w/ 5C Collet Closer. 2000 Lewis WRD Series mdl. WWRD1609SP Multi Stage Cleaning System s/n 6805 w/ Stainless Body. Lewis Heated Parts Washer s/n D2518A-3704 w/ Stainless Body. Dake mdl. 25H Hydraulic H-Frame Press. Concord 6” x 12” Surface Grinder w/ Magnetic Chuck. R15-101583 w/ 80 Gallon Tank. Dayton 2” Belt / 6” Disc Sander Combo. King Bench Model Drill Press. Burr King Vibra-King 200 Media Tumbler.